058. THE "FRAM." Issued by United Tobacco Companies (South) Ltd. (1931). 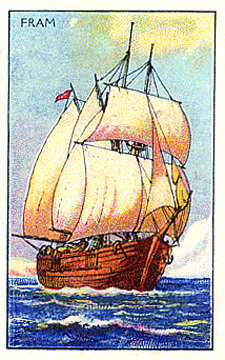 Card number 23 from a set of 40 entitled "Ships of All Times". Size: Ca, 2.5" x 1.6". Recto: View of the Fram under full sail. Upper left: Fram.